One of the greatest rewards of photographing landscapes is the transformative experience of being outdoors. Regardless of how well the photography goes, spending time in beautiful or invigorating environments is time well spent. Nonetheless, most landscape photographers would prefer to return from an excursion with new additions to the portfolio to show for it, and that desire can make exploring new areas seem like an imprudent expense of time. Focusing on results can lead to a creative cul-de-sac, however, sometimes causing a photographer to privilege scenes that are ‘safe bets’ instead of taking risks with unknown territory. Although playing it safe with familiar locations can bring desirable short-term results, the greatest rewards come from venturing outside one’s comfort zone and into situations that encourage personal discovery. Exploring new terrain is one of the greatest habits that a landscape photographer can form for the purposes of creative growth, not only because exploration is challenging, but also because it is exciting and extremely fun. An iconic view can be found not far from this location in Death Valley National Park, but I was more interested in finding out what I could see with a short hike up along a ridge in the surrounding badlands. 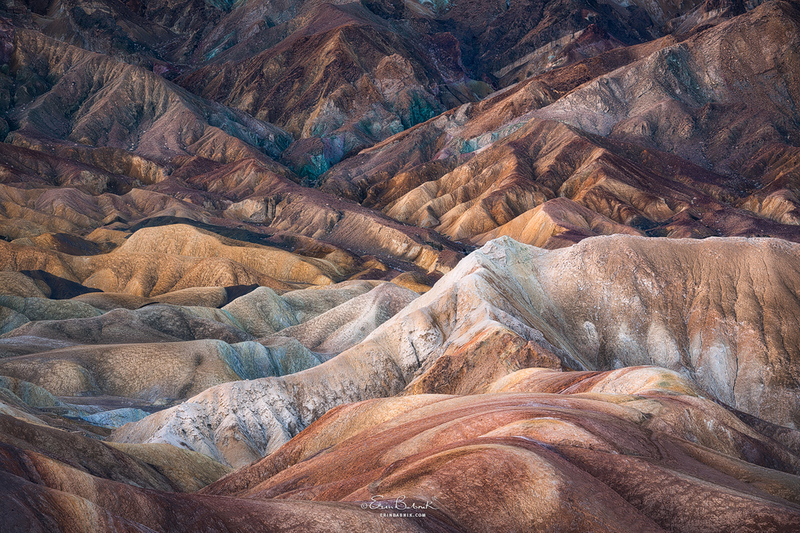 I found several high vantage points that provided excellent compositions when soft, predawn light hit the colorful layers of the area. Thanks to the wind being very light this particular morning, I was able get excellent sharpness for this 150mm composition at f/8, 1/6s, and ISO 100. 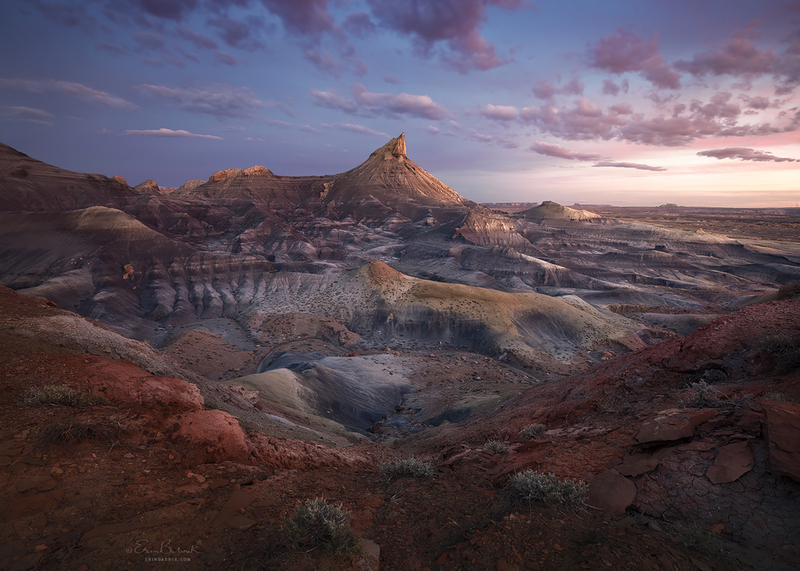 The process of exploring an unfamiliar location involves making a variety of decisions that can benefit the development of a landscape photographer. From the moment that we begin to ponder which destination to choose, we are invoking the creative process, letting our own interests and curiosity bring certain questions to mind. Pablo Picasso once called computers “useless” because, “They can only give you answers.” Indeed, asking questions can often be far more valuable than answering them, especially for anyone in a creative field such as photography. “What interests me about this place?” “What might I find here?” “What would I like to find here?” “How might it all change in different seasons?” Questions like these stimulate ideas and lead to experimentation. 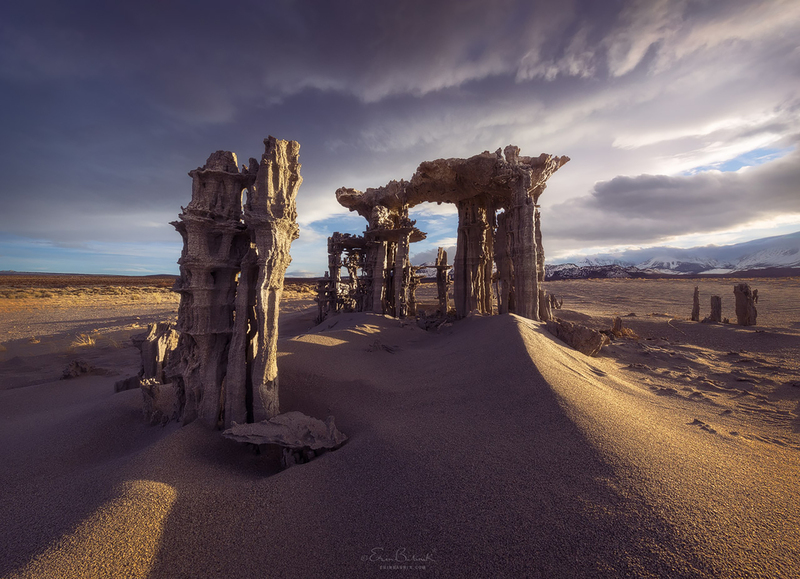 This area of the Mojave Desert has many small sand tufa formations that become more exposed or revealed as winds and precipitation move the sand around. Such areas can require new rounds of exploration with each visit in order to appreciate what opportunities have developed from changes in the terrain. I had photographed this particular tufa formation previously, but it had very different levels of sand around it on this visit. I noticed the sand drifts in the foreground of this photograph when I arrived, but they were not catching any light at the time. While I was working with a backlit composition featuring a sunstar, an opening in the clouds began to illuminate the sand drifts with a raking sidelight. Realizing that I was taking a risk, I plucked my camera off of my tripod, dashed around to the little sand drifts, and quickly repositioned myself on my elbows to catch this moment before it was gone forever. A small aperture of f/22 gave me the depth of field that I needed at 11mm to get the entire scene in one quick exposure. The opposite approach is to reproduce familiar scenes. Many locations in the world today are home to views that are proven crowd-pleasers, views that tend to sell well as prints and are likely to play well on social media channels because they trigger fond memories for many people. Of course such scenes gain their popularity by virtue of being particularly photogenic, and most of them are consistently interesting and accessible enough to offer a fairly high return on the investment of time that might go into photographing them. So there are a lot of good reasons why a photographer might want to concentrate on such scenes, but the world has much more to offer creative photographers, and it is extremely worthwhile to go beyond the obvious options. Although unfamiliar scenes run the risk of bringing no photographic rewards, they also have the potential to bring the highest ones. Any photograph that registers a high level of ‘seeing’ generally brings more satisfaction than one that draws its visual interest from any other quality. 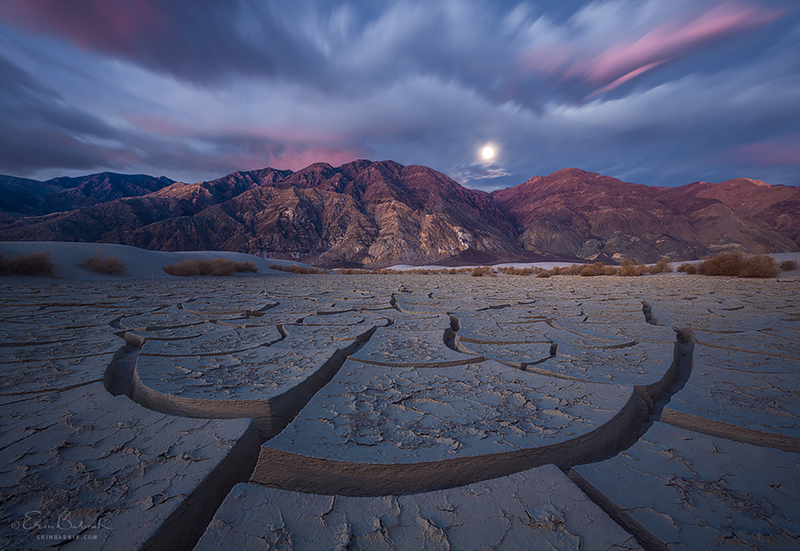 I discovered this expansive playa after exploring miles of desert terrain that contained a wide variety of mud tiles. Although I had found numerous exciting compositions across the many playas of the area, this one charmed me the most because of its alignment with the moon. I returned a month after finding this composition to catch the next full moon setting where I wanted it to appear in the photograph. By doing a focus stack of three exposures at 16mm and f/16, I was able to achieve sharp focus throughout the image. A shutter speed of 30 seconds was long enough to allow some dramatic motion blur in the fast-moving clouds without compromising the round shape of the setting moon. Even more importantly, the process of seeing, composing, and imagining possibilities is a precious experience in itself. Any photographer who has ever become immersed in these activities knows the feeling that many creatives call “The Zone,” that creative space that brings a sense of excitement and purpose and has lasting benefits for personal happiness and artistic growth. All of the photographs included in this article came out of my personal explorations and register my experiences of being in that wonderful state of creative flow. Last but not least, exploration is worthwhile for the sheer adventure of it. Not only is it exciting to experience new places, but true adventures are also great for sharing. Any landscape photographer who enjoys producing behind-the-scenes photographs or videos will likely produce the most interesting and entertaining content when bringing their audience along on a vicarious adventure. Exploration can happen anywhere. Once you venture out into an area where you are unsure of what you might find, you are exploring. An unknown area could lie adjacent to a known one; it could be very accessible; it could be unknown only to you. Choosing an area to explore can be a conscious part of the creative process or it can be the result of instinct or even of serendipity. If no location comes to mind immediately, you may find it helpful to consider certain aesthetics as starting points. Are you particularly attracted to atmospheric mountains or to mossy trees or to glistening icicles? Listen to what your aesthetic cravings are telling you, and then go looking for a place to satisfy them. Also remember that determination can usually bring about a viable plan, so allow yourself to think big. In my own experience, most obstacles are only temporary problems, including physical fitness, vertigo, financial challenges, and many other issues that might make a particular location seem unreachable at first. Although I had photographed this location in similar light a couple of years earlier, the compositions that I had found earlier were from lower vantage points, and I had resolved to try again from somewhere higher when I got the chance. Within a few steps of reaching this high ridge, I spotted a wonderful V-shape in the reddish soil, and I stopped dead in my tracks. I committed to this composition immediately and photographed the entirety of the golden hour and sunset without changing it. Of the many moments that I caught, I much preferred this one from shortly after the sun went down, when soft light brought out the marvelous variety of colors in the badlands. A focal length of 16mm gave me the amount of foreground that I desired, and settings of f/8, 30s, and ISO 100 allowed me to capture all of the scene’s light and shadows in one exposure. Today’s landscape photographers have a wealth of resources available that can aid in location research. Maps are of course an essential resource, and a plethora of options exists for consulting them. In addition to good old-fashioned paper maps, there are apps that can superimpose notations about celestial events onto a variety of digital maps (my personal favorite in this category is PhotoPills). Other apps can help you to navigate through remote terrain and to keep track of interesting features that you discover (Gaia GPS is a good choice in this category). And of course the venerable Google Earth is a great resource for virtual exploration, enabling a three-dimensional visualization of terrain and even how light will strike it during different times of day and months of the year. For areas where the terrain is highly changeable, such as desert environments, it can be helpful to look for satellite maps on websites that offer them from different years for the same location (such as TerraServer.com); knowing the history of change in a location can help to predict how its features might evolve in the future. 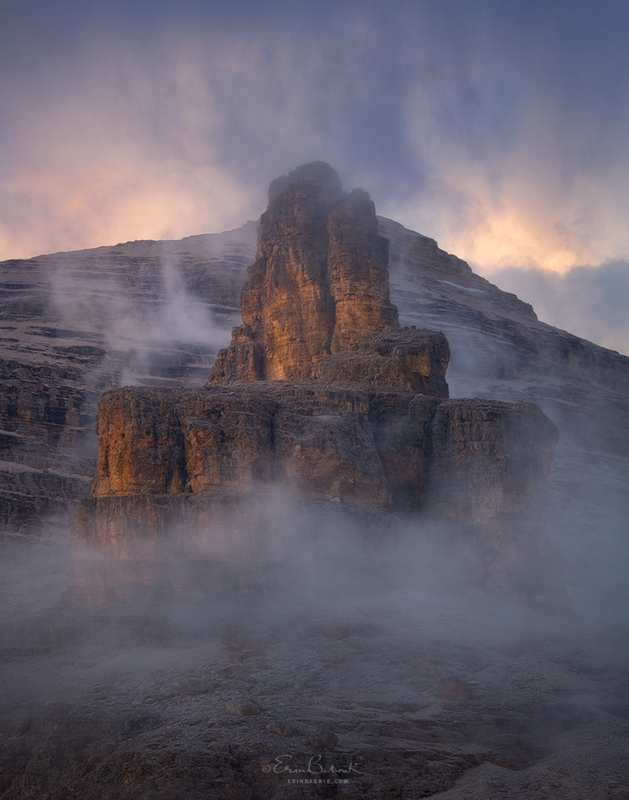 I first discovered this area of the Dolomites through studying topographical maps of the region. I had been drawn to a high alpine lake that aligned well with nearby peaks, but I ventured out from there to explore in all directions that were accessible without climbing equipment. This view presented itself to me on my third visit in as many years to a high meadow situated a few miles away from the lake. On my earliest visits I was most attracted to a prominent mountain to the north, but I later took interest in the wonderful layers of peaks to the east that caught some lovely morning light. A focal length of 173mm nicely compressed those layers, and an exposure of 13 seconds at f/11 softened the mist enough to provide some charming contrast with the hard edges of the mountains. There are many other resources that can be extremely useful for researching when to visit a particular location, such as weather apps (e.g. Wunderground), forecasting websites (such as NOAA, which features a detailed hourly forecast graph), apps that chart tidal changes (e.g. TideTrac), and a whole world of options for planning with the night sky. Beyond the essentials of maps and apps, there are a few other items of gear that I prefer to have with me at all times. For more remote locations, the importance of having a GPS SPOT device cannot be overstated. Having a well-stocked first aid kit is also important, as is an analog compass for longer treks. Finally, there is a creative tool that I recommend for all types of exploring, in locations both nearby and remote. I really appreciate being able to think through a location with the help of a small camera because it allows a certain level of freedom that is not always attainable with my regular camera gear. Even better is a small camera with more capability, such as the Canon M6. Having interchangeable lenses, a large touchscreen, and an APS-C sensor all in highly portable and lightweight package makes the M6 the perfect creative companion for exploration. It is useful not only for thinking through ideas to execute with a more substantial camera; it also has the resolution and image quality to produce photographs for a variety of final uses, including prints. So if you happen to catch a fleeting moment with the M6 while experimenting with your ideas, the resulting photograph could be a keeper that you would not have come away with otherwise. In addition, the M6 makes an excellent tool for capturing behind-the-scenes content or for vlogging while out adventuring, thanks to its flip-up screen, mic port, and its ability to record beautiful full HD 60p video. The French Alps is one of several regions that I have been exploring independently for many years. One of the first discoveries that I made there was this incredibly powerful waterfall created by the runoff from a glacier that initially drew me to the area. 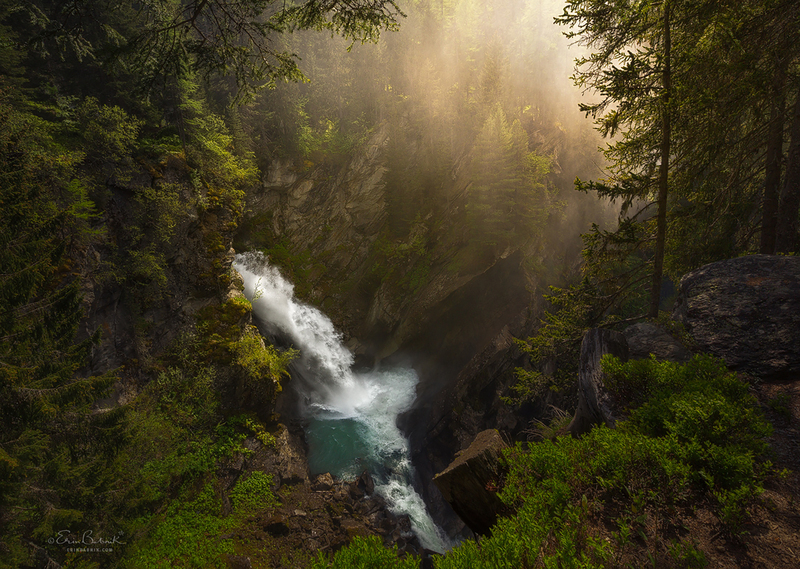 Although some waterfalls photograph particularly well through the use of slow shutter speeds, I found that smoothing out the water of this one robbed it of its powerful character. I chose a shutter speed of 1/100th of a second to retain more detail in the water as it soared into the air and crashed into the deep gorge below. At 16mm, f/11, and ISO 100, I was able to capture all of the depth of field and dynamic range that I needed in a single exposure. The greatest risk of exploring an area for landscape photography is the possibility that you will find nothing that results in particularly compelling photographs. Anyone who explores regularly will surely have days when the experience of being outdoors is better than the photography that results from it. So while exploring has the potential to result in photography of a certain high quality, it also has the potential to limit quantity. Although quality is typically regarded as the higher good in most contexts, the age-old dichotomy between quality and quantity is not wholly applicable to the creative process. In general, creative pursuits benefit from a lot of activity, and prolific artists tend to reach the highest levels of virtuosity. Practice not only helps to develop craftsmanship and technique, but it helps to work through ideas and to develop an approach to personal expression. Therefore, the problem of exploration limiting a photographer’s productivity is a legitimate concern. 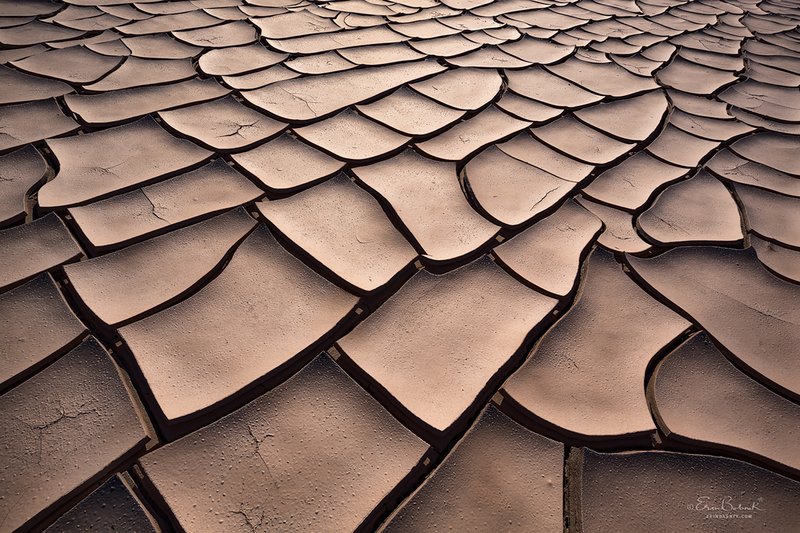 This playa of mud tiles was freshly formed when I first explored the area, presenting me with wonderfully smooth surfaces that reflected the sun’s light instead of absorbing it, as older tiles tend to do. Visiting the area repeatedly over a period of about a week, I determined which time of day would give me the most interesting quality of light on the tiles. A single exposure at 21mm and f/16 gave me all of the depth of field that I needed to photograph this section of the playa that measured about twenty feet across. So how does one find the right balance between exploring regularly and producing photographs regularly? My suggestion is to experiment extensively with whatever you do find while out exploring. Photograph smaller scenes, vignettes of nature, distant details, and grand landscapes, regardless of your usual habits that might omit some of these options. Work in different qualities of light and in weather conditions that might seem unappealing or even absurd at first. Even if these experiments do not all result in portfolio images, they are sure to be valuable exercises in seeing, in imagining, in practicing technique, and in asking questions that can lead to creative growth. Landscape photographers create their art through a combination of technology and ‘found’ outdoor features, both of which can seem inflexible at times. Technology always has its constraints, and outdoor features are relatively fixed as subjects go—so exactly where any room for creativity lies in that mix is not always obvious. Therefore, it can be challenging for a photographer to develop his or her creative voice and to identify it once it takes shape. Fortunately, habitual exploration can help to support creative development by providing a foundation for it. Choosing locations, seeing visual opportunities, and bringing pre-visualized ideas to life can all combine as a sort of hallmark of the artist in the end. Indeed, the more that you find to photograph, the more that you find yourself. 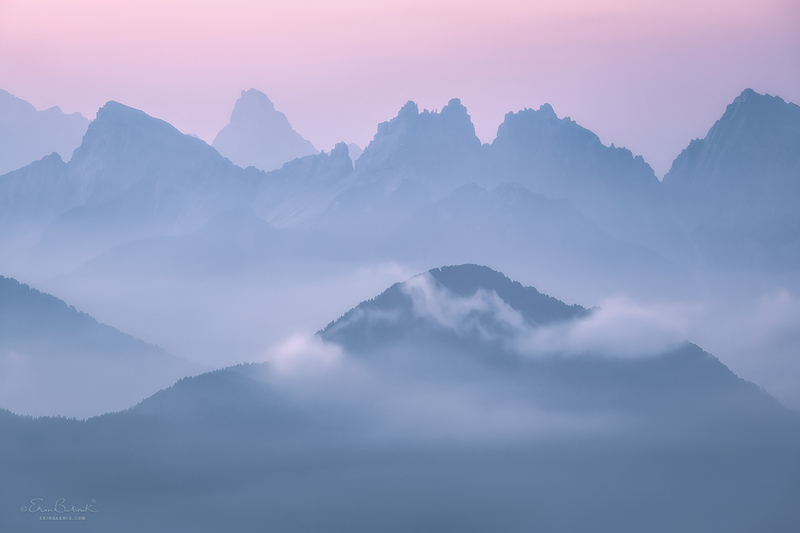 I have spent nearly a decade exploring the many massifs of the Italian Dolomites, and I am constantly finding new peaks and crags within them that are especially photogenic. A variety of small pinnacles in this particular area had caught my eye and enticed me to spend a few days hiking around them. During an afternoon when low clouds were moving through the area, I spotted this little formation emerging from the atmosphere and was amused by how much it resembled a rocket ship about to lift off. I had no time to lose before the moment would be gone, so I quickly pulled out my camera and shot the scene without setting up my tripod. I used a relatively wide aperture of f/5.6, ISO 400, 1/200th sec, and image stabilization on my 70-200mm f/4L IS lens to ensure excellent sharpness for this 70mm composition.